• Shrimp are sold by count, which is expressed as a numerical range of shrimp per pound. • Shrimp can be served cold or hot. • To test a shrimp for freshness make sure they are dry and firm. • To end up with 1 pound of cooked shrimp you need to buy between 2 and 2 1/2 pounds of raw, unpeeled, or “green”, shrimp. • Shrimp can be cooked both in the shell or peeled. Cooking in the shell adds considerable flavor. • To avoid tough curled shrimps, drain them immediately when finished cooking. The fact is…shrimp are one of the most popular kind of seafood in the United States. So go out and try some locally harvested shrimp, either in an independent restaurant or grab some from your local fish market! Is your favorite seafood in season? especially when selecting which shellfish to eat. In the winter season we like to enjoy oyster roasts and steaming bowls of clam chowder, but there are a few things to remember and look for when selecting live oysters and clams. Be sure the shells are tightly closed, if open, they should shut when tapped. The shells should be intact and moist, and there should be a mild scent. Always avoid gaping shells that do not shut when tapped, shells that are cracked, chipped, or dry and there should not be a strong “fishy” odor. Be safe and enjoy our local seafood! For more information on when our local seafood is available, go to the Outer Banks Catch link below. See which fish and shellfish are in season so you know what’s the freshest fish for your plate! Outer Banks – stay local, eat local! Site of the world’s first controlled powered flight on December 17, 1903. The Visitor Center features full-scale reproductions of the Wright 1903 Powered Flyer and interpretive presentations. A pavilion boasts an exhibit hall with special exhibits, including a replica of the 1902 Wright Glider and a multipurpose auditorium. 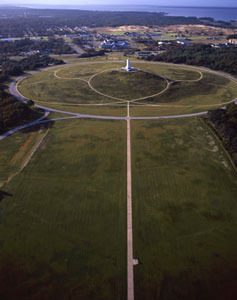 The grounds include historical markers of each attempted powered flight, replica camp buildings and a 60-foot granite monument on top of Big Kill Devil Hill (a 90-foot dune) honoring the Wright brothers. 9 a.m. – 5 p.m. (hours are extended during summer months). Open year-round. Closed Christmas Day. $40 – Vans / Small buses holding 7 – 25 people. School sponsored programs may be eligible for a waiver of fees. Visitor Center facilities include a bookstore, rest rooms, and telephones.